The Pacific Crest Trail passes through Ebbetts Pass. Named after Major John Ebbett and pointed out in 1853 to surveyor G.H. Goodard who referred to it as a "route of great promise - probably the best one for a transcontinental railway." No emigrant train used this route but a stage road was completed here in 1864 to serve mining region of Silver City. How Did John Ebbetts Spell His Name? 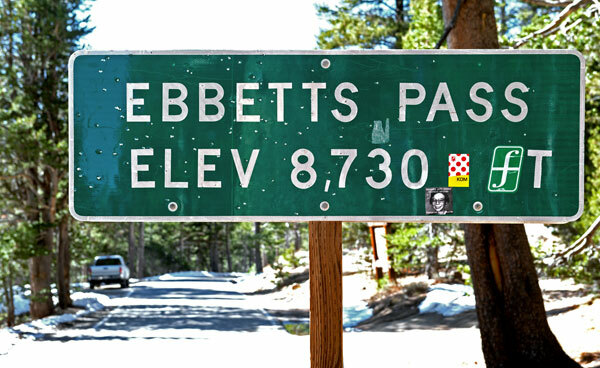 In researching Ebbetts Pass, I have come across four spellings: Ebbetts, Ebbet's, Ebbett's, Ebbetts'. According to different sources, the pass was named after either "Major" Ebbetts or Major Ebbets or "Major" Ebbett. The word major is usually, but not always, in quotes. "Major" J.A.N. 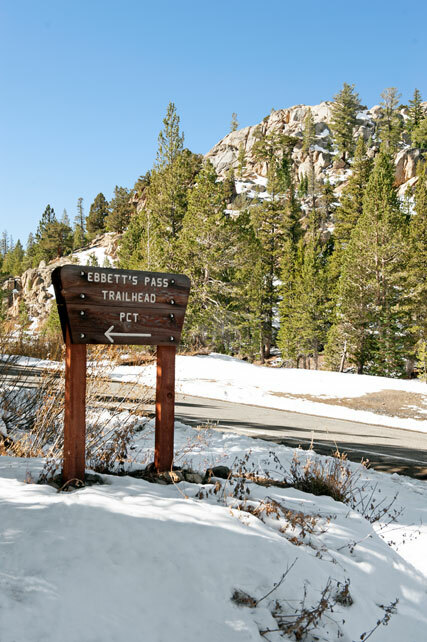 Ebbetts claimed to have led a group of miners and mules east over the Sierras in 1851, using a snow-free pass at the headwaters of the Mokelumne River. Later, in 1853, he led a railroad survey team across the Sonora Pass region. From a high peak just east of Sonora Pass he pointed north to the pass he thought he took in 1851 to George Goddard, a mapmaker. In 1854, Ebbetts died in a steamer explosion. 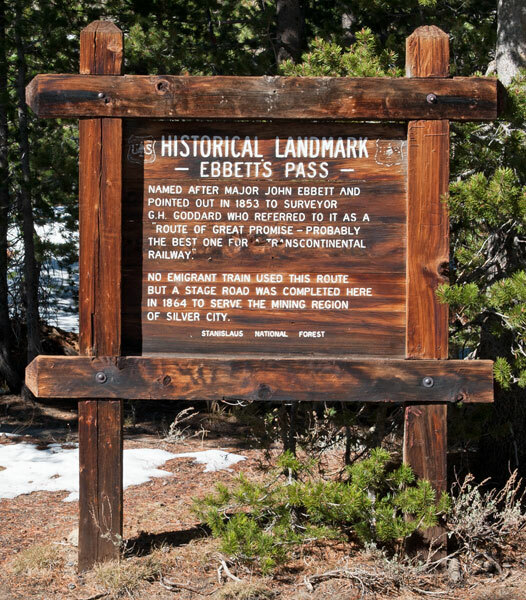 In memoriam, Goddard placed the name Ebbetts Pass on the map he completed in 1856, approximately in the region he thought Ebbetts had pointed out. It was not until 1893, however, that the U.S. Geological Survey team, in drafting the Markleeville Quadrangle, officially named the location for Ebbetts. From page 90 of the 1854 Surveyor General Report: "the pass we called Ebbets' pass, in memory of Major Ebbets who went over it in the spring of 1851, with a large train of mules, and who found no snow there in April." John Ebbetts came to California in 1849 as captain of the Knickerbocker Exploring Company, and died April 15, 1854, in the wreck of the Secretary in San Pablo Strait. 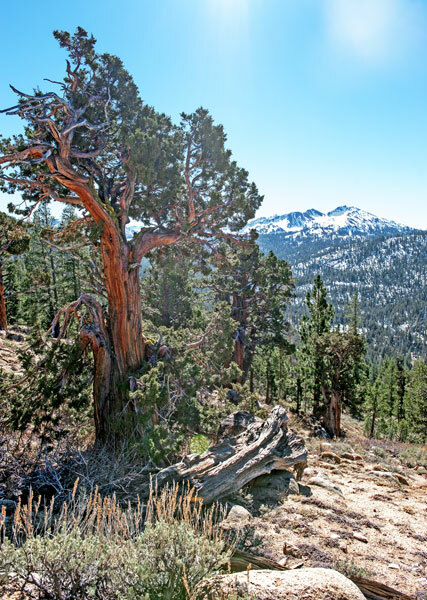 From the Whitney Survey, Geology I: "In 1863 this was a simple trail, and it crossed the route designated on Britton and Rey's map as 'Ebbett's Pass'; this name is, however, no longer known in the region, as we could find no one who had ever heard of it. The old name was restored when the Geological Survey surveyed the Markleeville quadrangle in 1893.